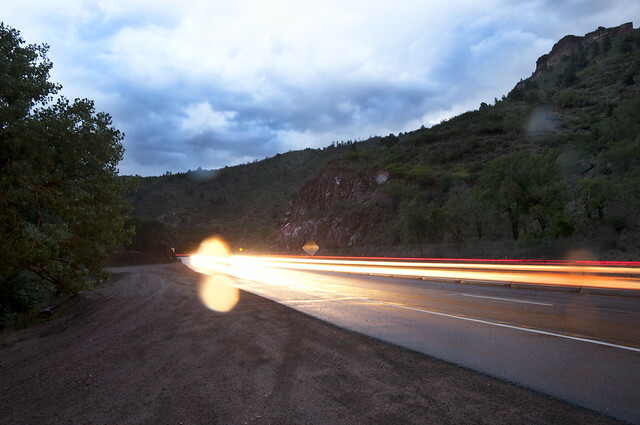 As the train pulled out of Glenwood Springs, I noticed a reddish haze in the air. At first, it was barely perceptible, seen only when it turned the disk of the midday sun blood red. 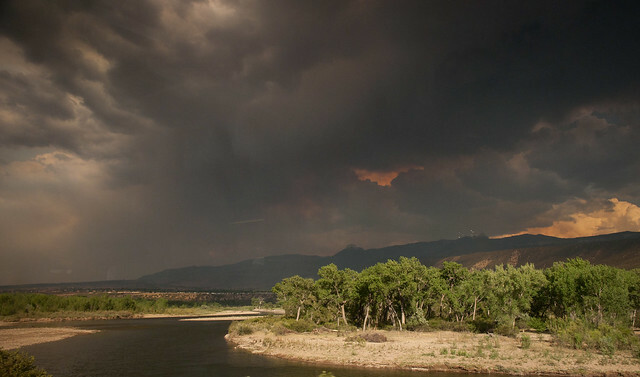 Soon, we left Glenwood Canyon and continued west, the haze thickening the partly cloudy sky into a roiling mixture of reddish-black and grey. The source of the haze had not been apparent, but as we rounded a bend in the track, it was suddenly clear: the miles-long plume of thick, black smoke before us left little doubt. 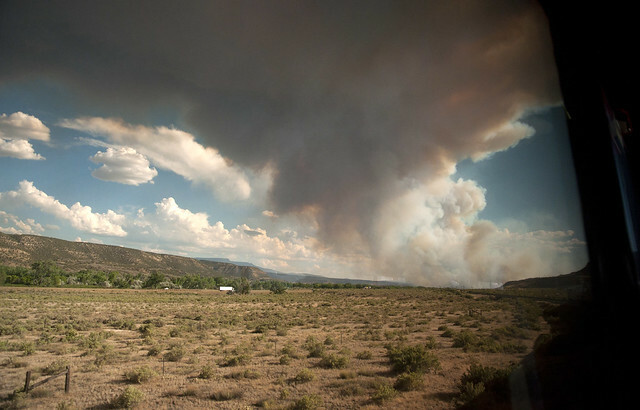 We were headed straight for a Colorado wildfire. Before long, Forest Service and fire trucks were frequent sights at grade crossings. 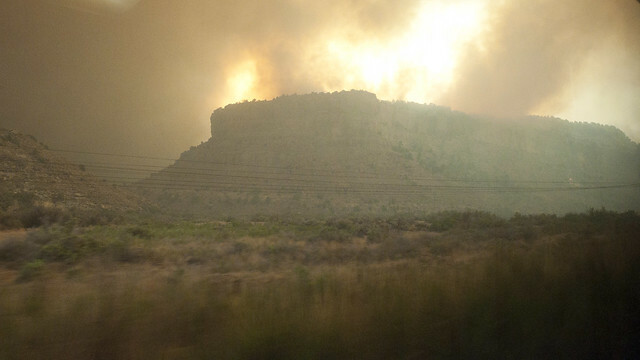 By the time we entered De Beque Canyon, through which both the rail line and Interstate 70 run, the fire was burning on the tops of the ridges next to us and down the canyon walls. The sky became completely obscured, save for a crimson sun, by a thick smoke that appeared to glow red at times from the reflected flame. 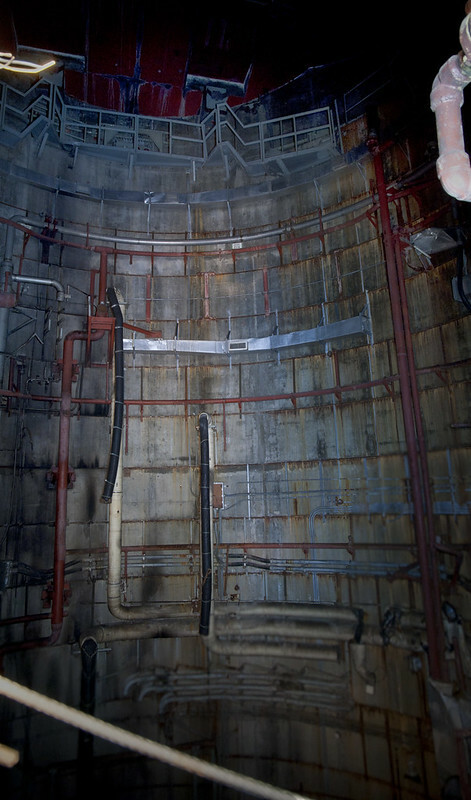 I ran to the lower level vestibule of my car and began taking photographs and video out of the window – which, when I pressed my hand to it, was almost scorching hot to the touch. A few tense minutes later, we were clear of the canyon, and the dispatchers at Union Pacific (who currently own the line) shut it down – we were the last to pass. 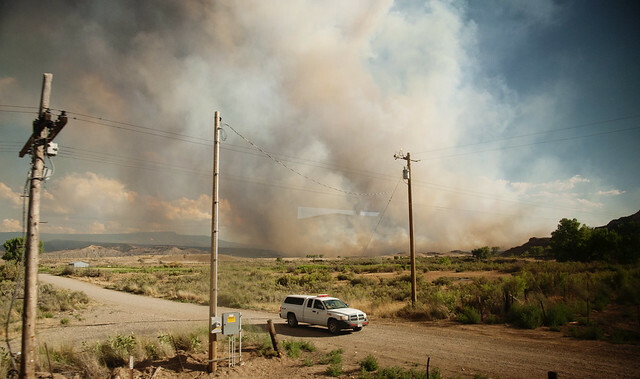 The adjoining Interstate was shut down as well, and the nearby communities of De Beque and Palisade were put on evacuation notice. 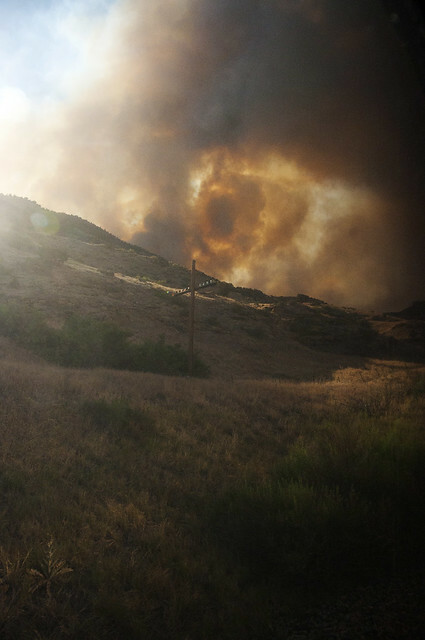 The fire consumed more than 12,000 acres by the time it was extinguished – but fortunately, no lives were lost. The Zephyr passes through the Pine Ridge Fire as myself and a fellow passenger look on. Click here for the BBC version. 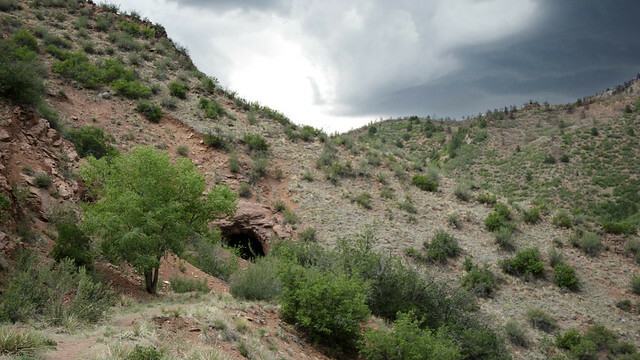 After a few tense minutes, we cleared De Beque Canyon unscathed and headed into Grand Junction, a city at the far reaches of the Colorado Rockies. From here, we would set out across the desert for Salt Lake City, arriving there early in the morning. The sun had begun to set, still hazy red from the fire to the east. I disembarked, along with the train’s passengers stretching their legs as a fresh locomotive crew did their checks before setting off for the night. The city’s former depot, a grand turn-of-the-century building, sits dilapidated next to the current station. 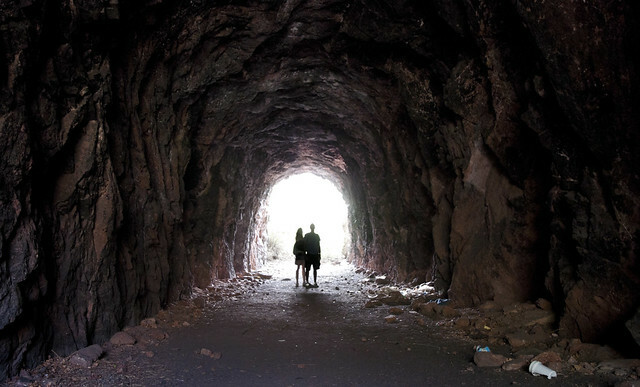 It was built in the early 1900s by the Rio Grande, and was meant to be the centerpiece of the town; a place that the citizens of Grand Junction (which essentially exists because of the railroads) could take pride in as a representation of their community. Inside were 22 foot high ceilings and arched stained glass windows. Now, Amtrak uses an unremarkable 70s-era building next door that originally served as a restaurant for the depot. 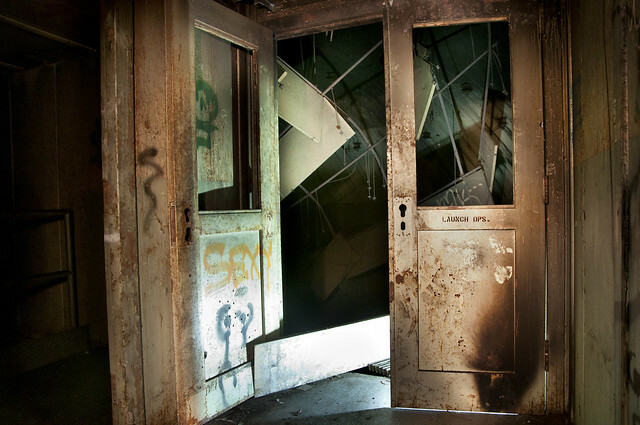 In February of 2012, a Texas-based realtor purchased the dilapidated structure for just over $188,000, though with admittedly no real plans to start with. 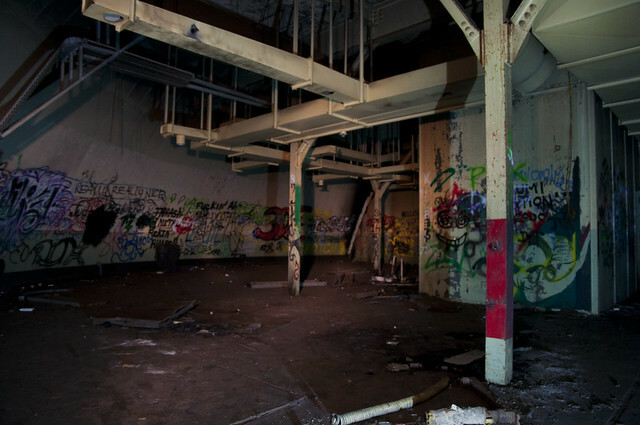 Time will tell what happens to this historic structure, one which has no doubt seen some interesting, if better, times. Onward now, as the locomotives sounded their horns, and with fresh crews aboard, we headed out for the evening. As the sun began to set, I headed to the diner car for dinner and a smuggled pint. 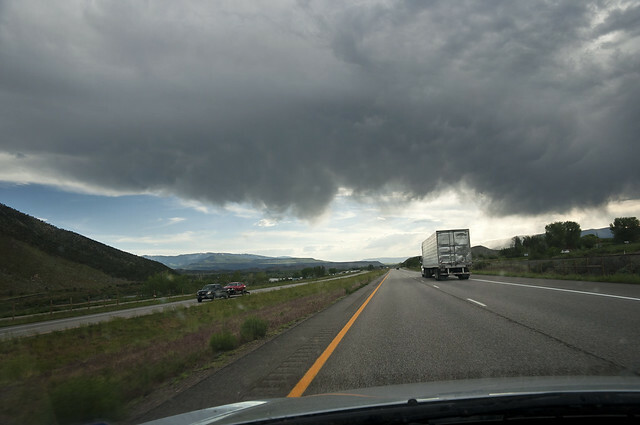 The car was surprisingly lively, with groups of passengers scooting closer to the window to see what the eastern reaches of Colorado held in store. 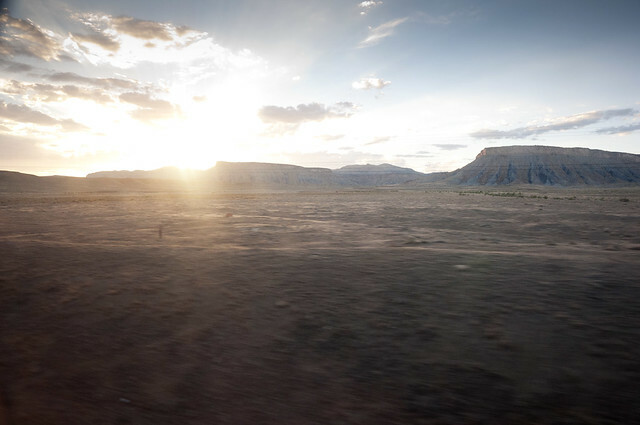 The Mennonites had returned, settling in en masse to the swiveling chairs on a whole side of the car to watch the sun come down behind the flat-topped mesas that stood guard to either side of our route. 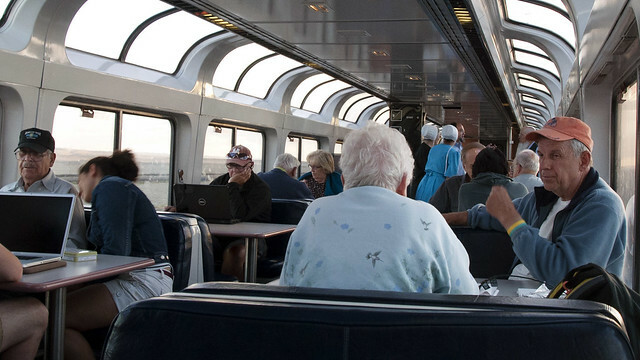 Passengers in the Zephyr’s lounge car socialize as the sun begins to set on the Colorado Plateau. 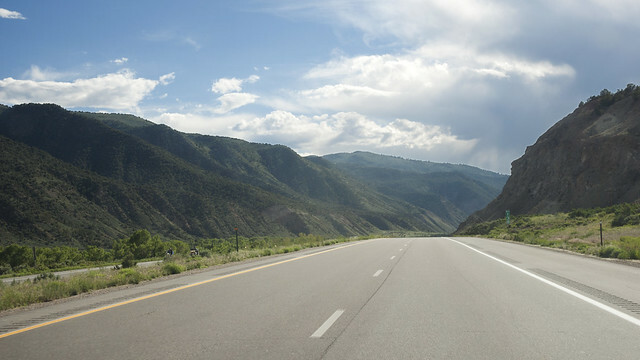 Just ahead lay the Utah border – and about 260 miles of desert. 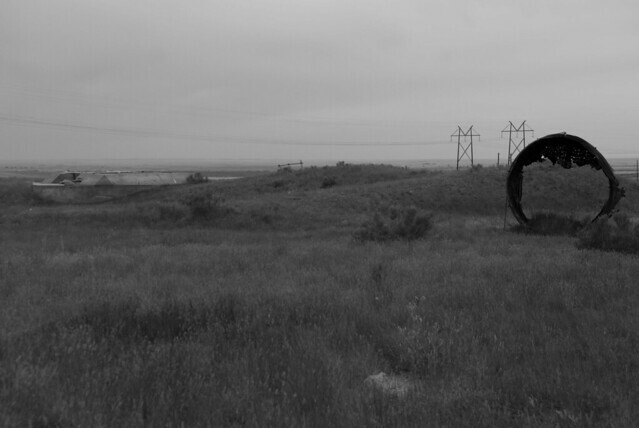 Spray painted on the side of one of these weathered red sentinels were the words ‘UTAHCOLORADO’ – denoting the literal line in the sand where the border lay. 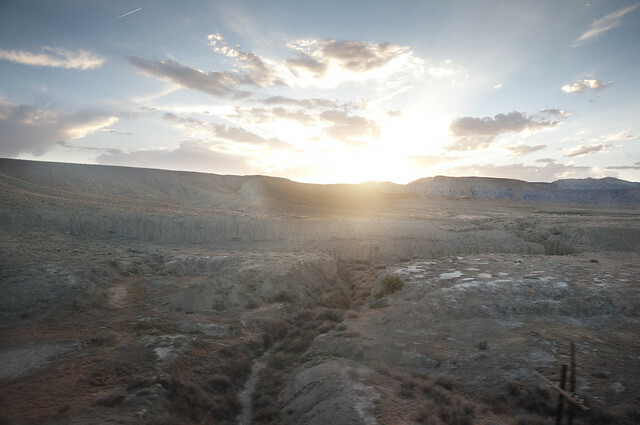 Eastern Utah is where sci-fi directors go when they’re looking for an alien planet to film on. Before the sun set, it cast the bizarre landforms of the immense desert in an unearthly glow. The Zephyr was picking up the pace now, the track straightening out as we exited the heart of the Rockies. 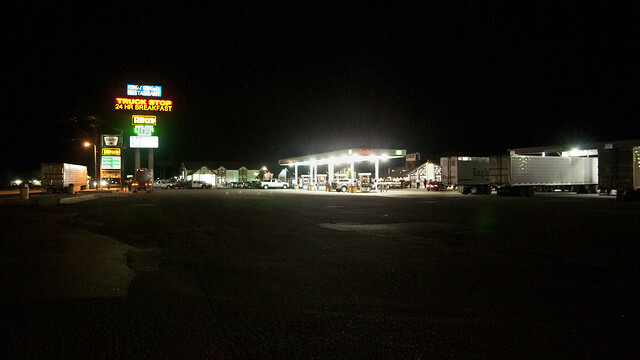 We wouldn’t stop until we hit the tiny oasis of Green River, seventy miles ahead. 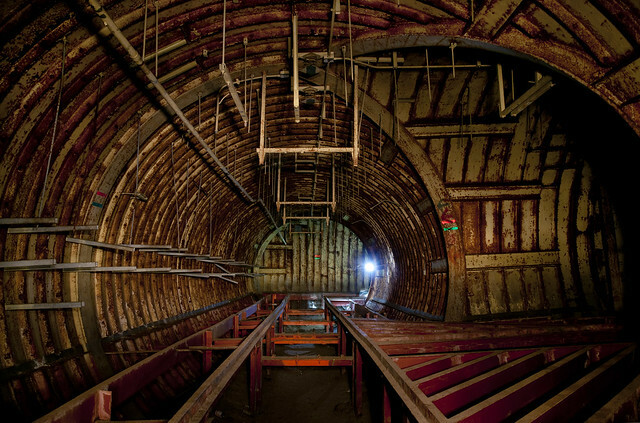 This siding, at a place called Brendel, held a number of flat cars carrying half-length metal casks marked ‘RADIOACTIVE’ – as well as a similar number of unmarked black pick-ups. 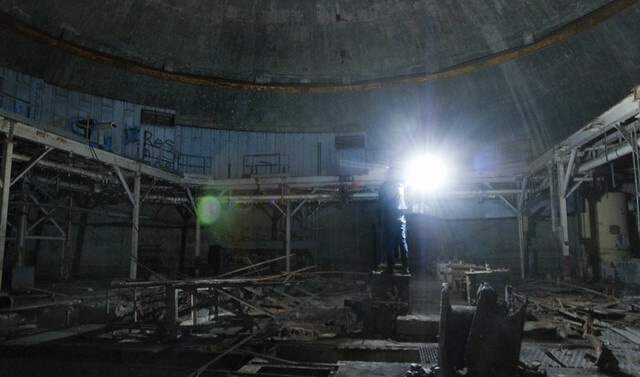 Turns out this location is used to hold lightly radioactive mine waste from a uranium mine near Moab before its burial nearby. We hit Green River just as the sun set, our train stopping for no more than a breather before pushing off again into the night. 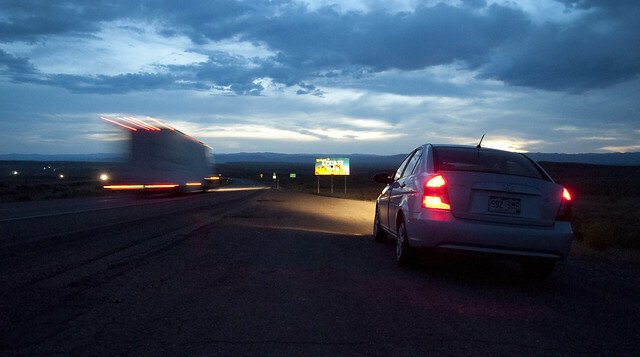 Ahead, we would cross the rest of the desert under the stars, climbing the last, faraway range of the Rocky Mountains in the moonlight before descending into Salt Lake City around one in the morning. Night owls in the Zephyr’s lounge car around midnight. 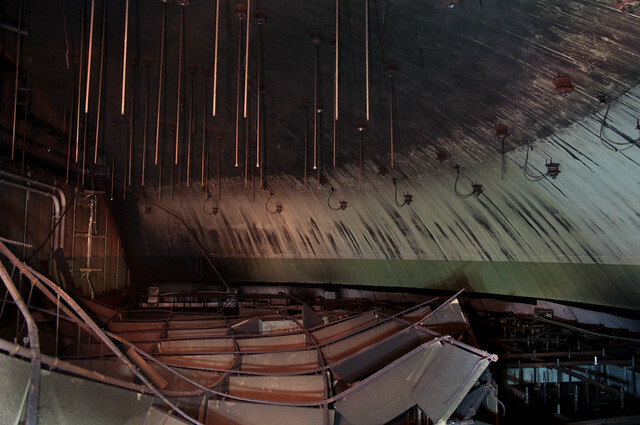 After sundown, I returned briefly to the vestibule of the car where I had witnessed the fire before. The magic window once again opened, and in the warm night air of the desert, I could see the distant lights of a power plant. They winked at me again and again as they passed behind ridge after mountain after canyon wall. 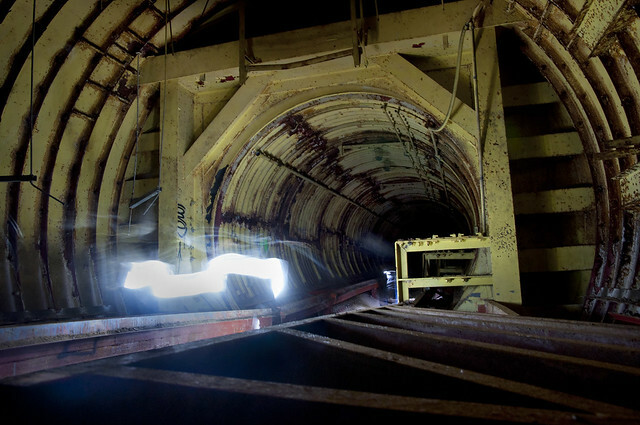 Soon, the lights appeared just up the track, and swiftly flew past us into the night again. I headed back to my seat, only to remember it had been given to part of a family before – sleeping bodies now occupied my whole row. I elected to become a nomad, and found myself a quiet corner of the car next door with a conveniently unoccupied row of seats. Across the aisle was a fellow traveler named Sam. I asked Sam if the seats were free, and in a Cockney accent, he replied “I dunno, I just sat down in this one!” Brilliant plan! I checked one more time above my seats for reservation slips, and, finding none, I settled off to sleep. Julia tracked me down and roused me a few hours later, just short of 1.30AM. A few minutes later, I stepped off the Zephyr at my final destination, the promised land: Salt Lake City. The train squeaked to a stop and I disembarked under a star-filled sky. Julia bids me farewell with one more dose of sass. 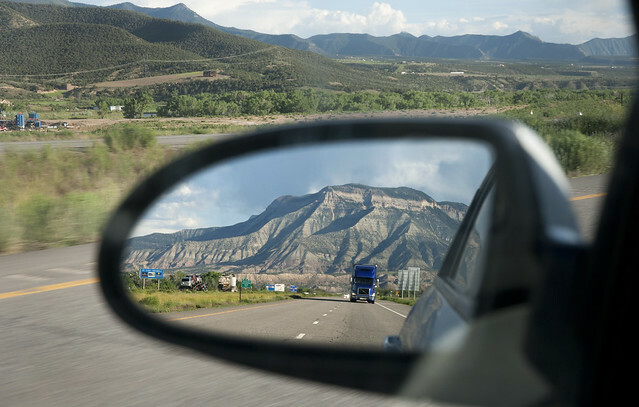 Travel in today’s United States is mostly about two things: the automobile, which is a fixture in every part of America, and the airplane, which made the vast expanses of the U.S. easy to cross in mere hours. However, one form of transport that was so crucial to the history of the United States is often overlooked in favor of these two: the train. 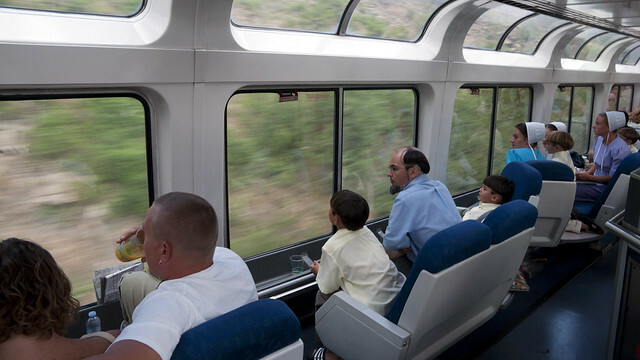 Even though train travel in the U.S. (at least outside of the Northeast) is often seen as the domain of families and retirees it can still be a perfectly viable means of travel for those seeking no more than transport in style. 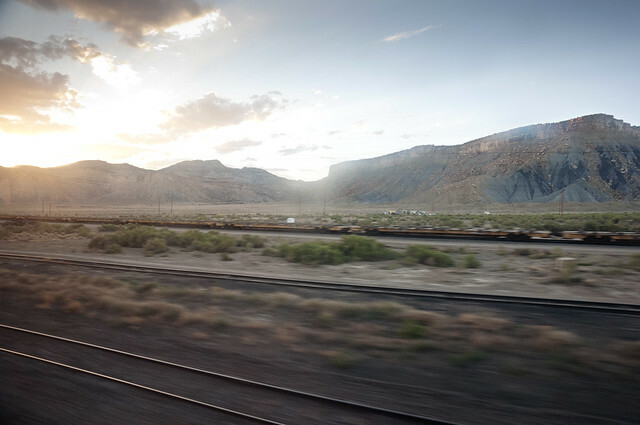 One of the most well known of America’s modern passenger train routes is the California Zephyr, a named train that has its roots in the postwar 1940s. The route of the original Zephyr from Chicago to San Francisco was a cooperative hand-off effort of three American railroads, all now defunct. 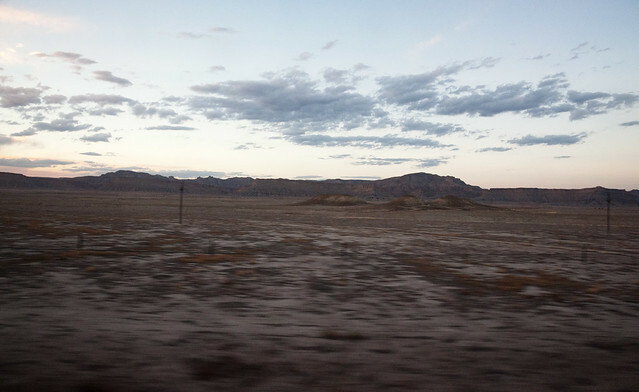 This relay race of sorts led passengers through some of the most beautiful parts of North America, including the headwaters of the Colorado River in the high Rockies, the strange desolation of the Utah desert, and the peaks of the Sierra Nevada. The most difficult portion for the Zephyr to traverse, from Denver through the Rockies to Salt Lake City, was the job of the Denver and Rio Grande Western Railroad – and this was no small task. 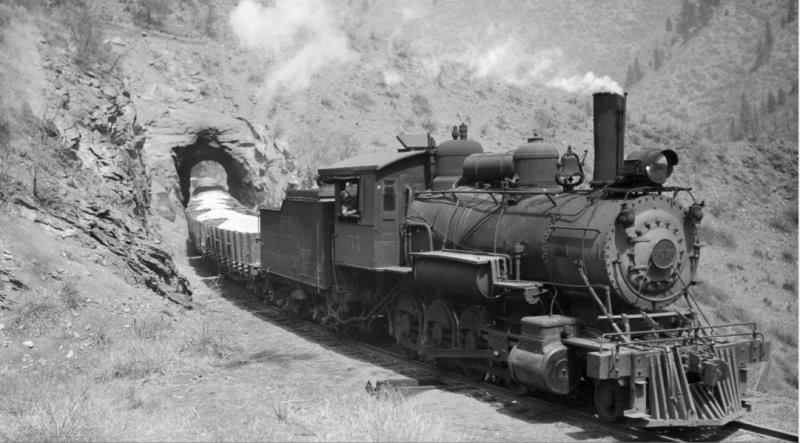 The gold and silver rushes of the mid to late 1800s caused a huge amount of railroad expansion into the Rocky Mountains of Colorado in search of riches, and dozens of narrow and standard gauge railroad lines stretched between the unforgiving peaks. 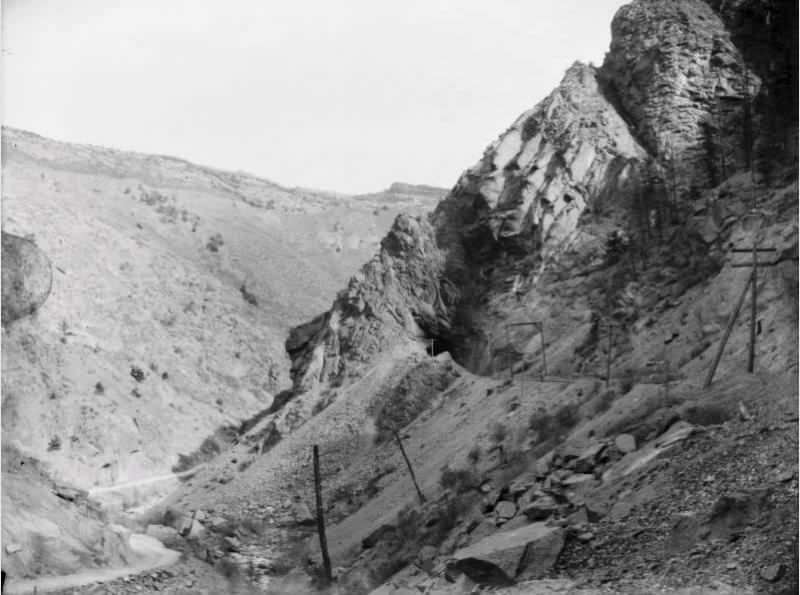 The engineering challenges were gargantuan; narrow, treacherous passages like the Black Canyon of the Gunnison proved almost impossible to build through, steep grades and treeless high mountain passes had to be negotiated, sometimes by blasting paths out of solid rock, and deadly winter blizzards forced shutdowns and stoppages again and again. A map of the Denver and Rio Grande Western circa 1930, showing Colorado crisscrossed with rail lines originally built by at least a dozen companies. 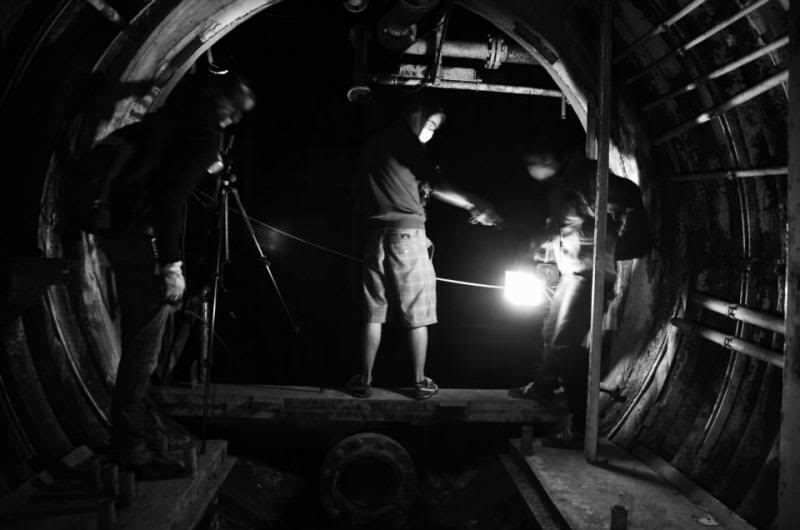 By 1930, the D&RGW had absorbed almost all of them into their dual gauge system – the lines in black are 3′ (90 cm) gauge while the red ones are standard 4′ 8½” (1.4 m). 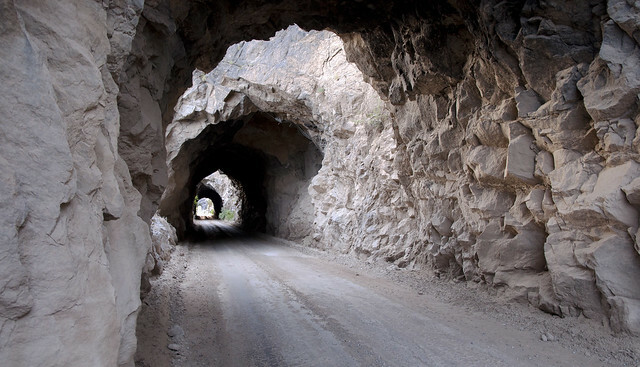 The Rio Grande’s mountain routes have been famous since their inception for the staggering scenery along the way. 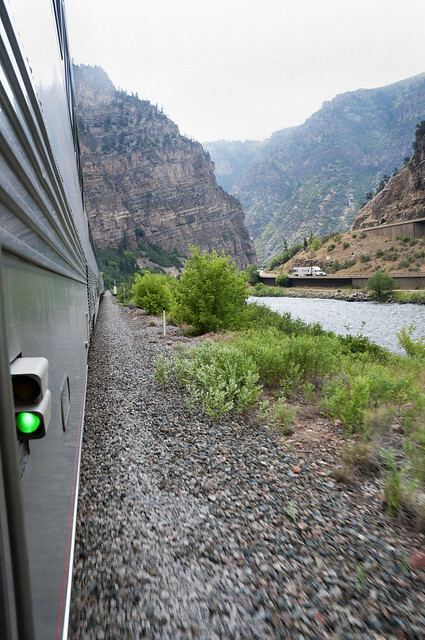 Originally, mainline trains had to travel from Denver to Pueblo before turning west into the Rockies, then into the Royal Gorge of the Gunnison River and through the impossibly deep Black Canyon before climbing north over Tennessee Pass – the highest point on the entire US rail system. From the top of the pass, trains then descended the Eagle River valley (passing through Belden) and met the banks of the Colorado River, following it west again through Glenwood and De Beque Canyons before clearing the Rockies. 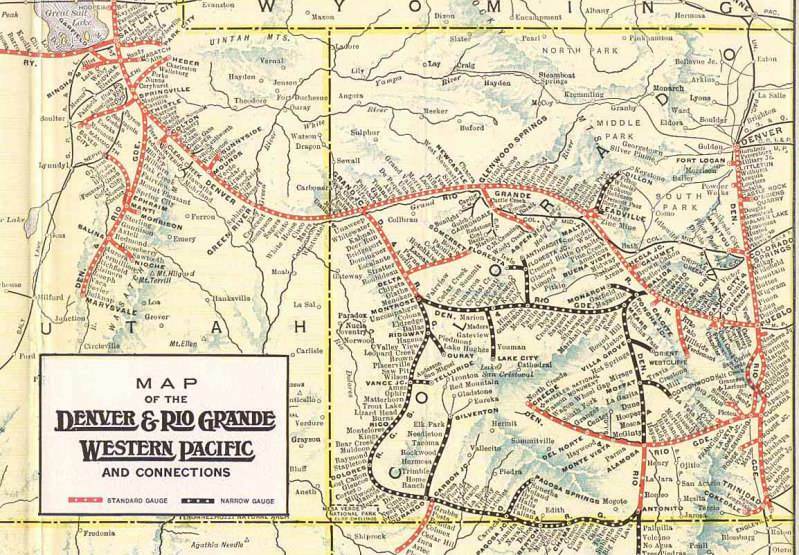 This way of doing things was an ethos for ‘the Grande’; their motto was ‘Through the Rockies, Not Around Them’ – a bit of a jab at their competitors (and, ironically, their eventual owners) to the north, the Union Pacific Railroad. 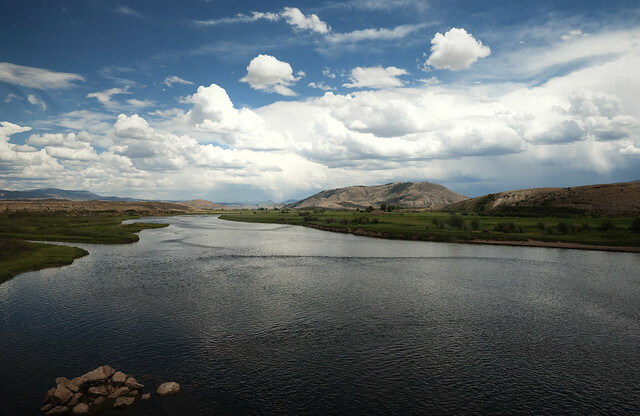 The UP used a much easier route through the gradual, easy grades of South Pass in Wyoming, whereas the Rio Grande went west the hard way – straight through the heart of the mountains. 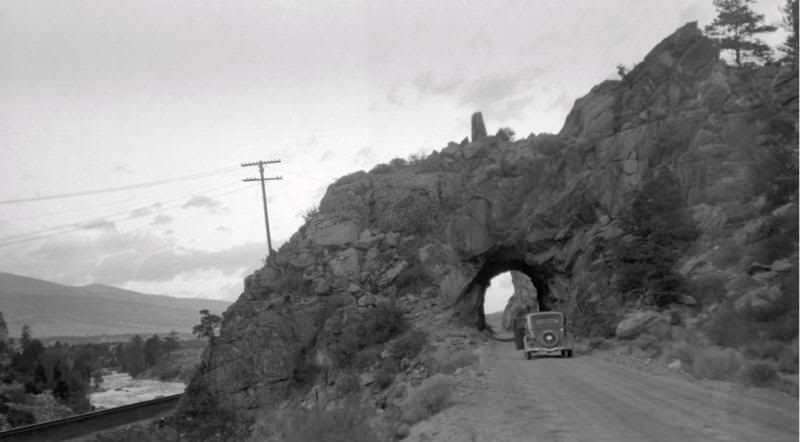 However, as airplanes and automobiles took over for long-distance trains, the preferred way of crossing the Rockies changed – gone were the days of teams of locomotives shoving passengers over high passes and through smoky tunnels. In 1971, during the height of the Oil Crisis, all of America’s mainline railroads ceased passenger operations, handing them in bulk over to a hastily organized state corporation – Amtrak was born. 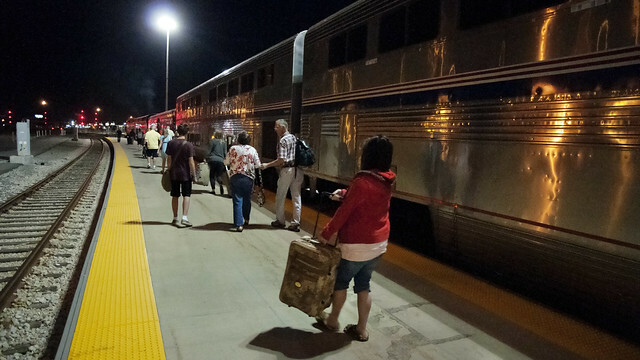 However, the D&RGW, long known for its independent streak, shunned Amtrak and continued to operate its portion of the Zephyr route as the Rio Grande Zephyr until 24 April 1983, when further declines in passengers finally forced the Grande to hand the Zephyr route over to Amtrak. 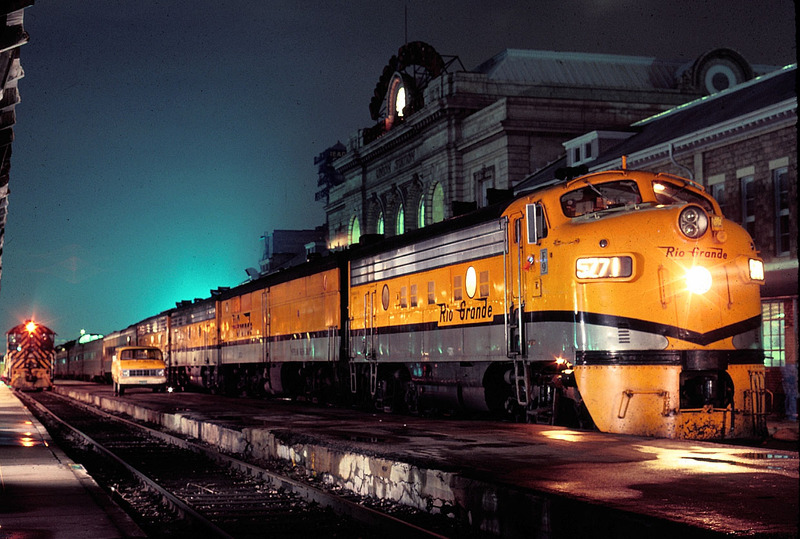 The Rio Grande Zephyr waits for its final departure from Denver’s Union Station on 24 April 1983. Photo by Slideshow Bruce via Wikimedia. Jump ahead now, if you will, to the present day. In the middle of summer, I decided that a friend in Salt Lake City was long overdue for a visit. 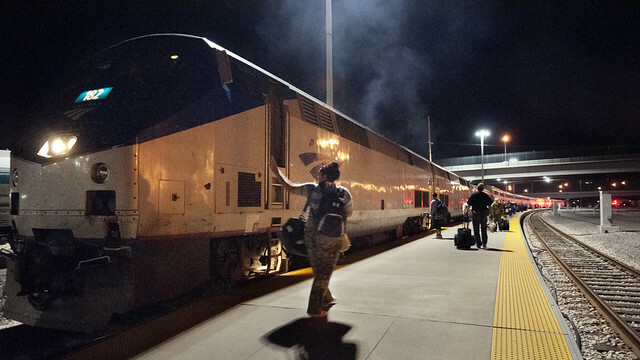 I booked myself a train ticket, and on the appointed day, my California Zephyr showed up at Denver’s temporary Amtrak station backwards – and nearly two hours late. The backwards part is perfectly normal, with Denver’s Union Station resting on a long stub of track that requires the reverse move for access. Today, it was track maintenance and a few passing freight trains east of Denver that held Train #5 up, but no matter; soon we would head out of Denver for the high country and begin making that time back. 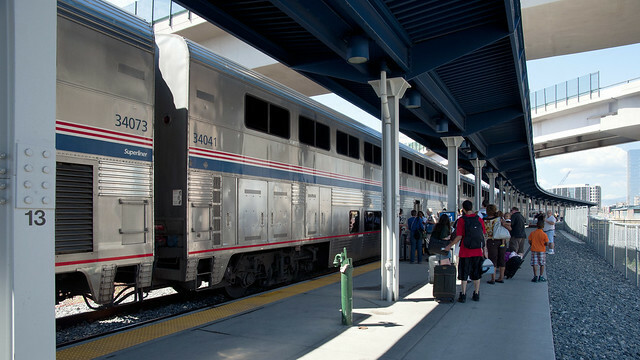 Passengers wait to board the Zephyr at Denver’s temporary Amtrak station. Union Station, the Zephyr’s stop since the 1930s, is being turned into a regional commuter rail terminal, and will reopen in 2014. With a smooth push, the Zephyr pulled out and we were on our way. My car was overseen by conductor Julia Thompson-Johnson of Chicago, a capable professional traveler. 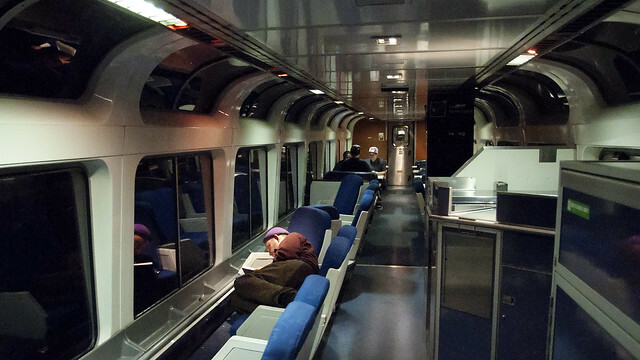 Amtrak’s conductors do far more than simply taking tickets; they are the masters of the rails, seeing to everything from extra blankets for toddlers in transit to midnight wake-up calls. 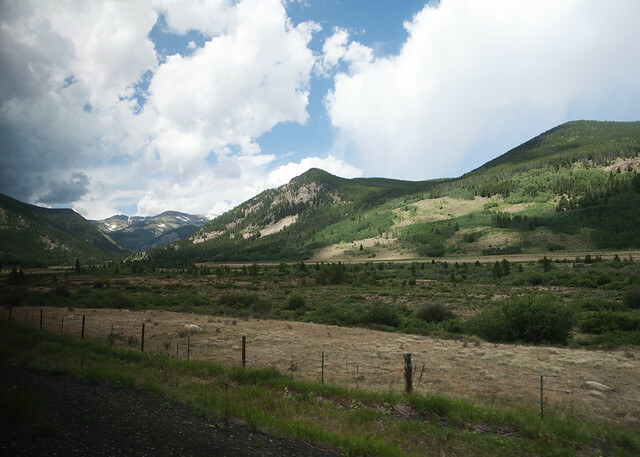 I found myself a seat and watched out the window of the café car as the train pulled out of Denver’s freight yards and headed for the Rockies. As we ascended up the Front Range, I noticed a group of people who looked as if they were from another century. 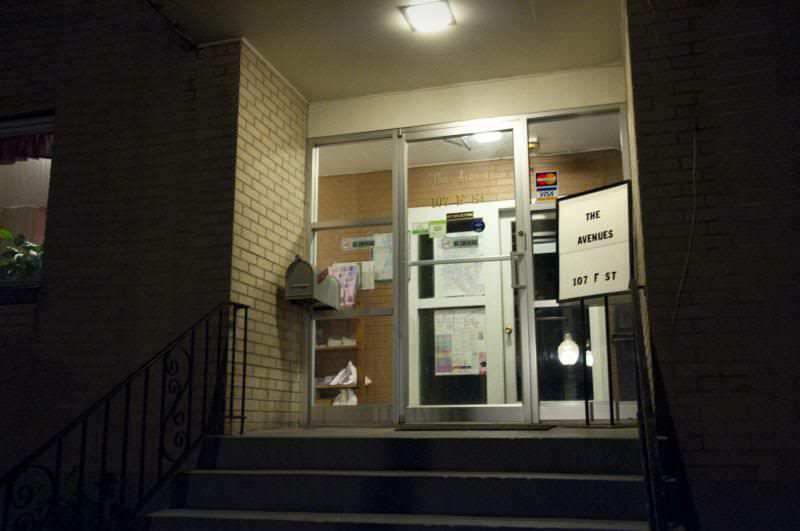 They sported bonnets, dresses, and long beards for the men – members of the Mennonite religious order, as it turns out. Mennonites are similar in dress to their more well-known Amish cousins, and like them eschew most modern technology. However, their order permits them to travel long distances using trains, allowing this group to leave their native Ohio for sunny California. 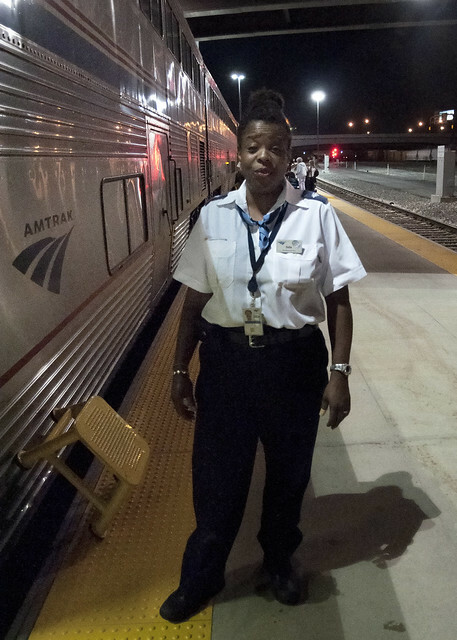 To these people, Amtrak is their primary link to the rest of the country – an essential service indeed. 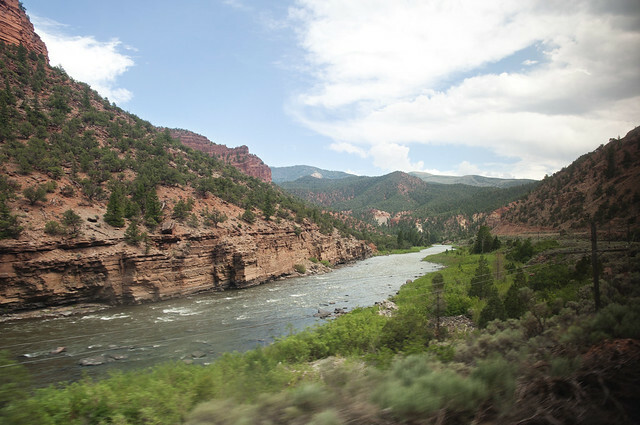 As the train pushes into the Rockies, the terrain gets much more dramatic. As we approached the Continental Divide, the mountains seemed to swell around us, as if they were trying to outsmart us, trying to trap the train in some nameless alpine crevice. Originally, trains on this route had to make a tortuous ascent up a 4% grade to the summit of Rollins Pass, well above timberline at 11,660 ft (3,554 m). Winter was not a kind season to the railroad, with blizzards stranding passengers in tens of feet of snow, even after a series of tall sheds were built over the tracks to protect them. By the early 1900s, the need for an alternative was apparent; the railroad was spending more than forty percent of its money on fighting the snow. 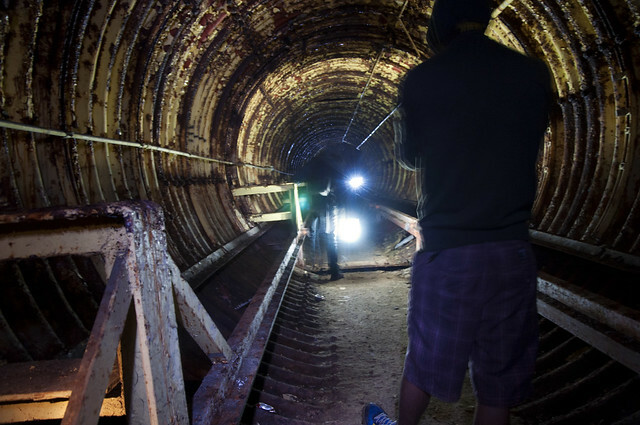 Denver entrepreneur David Moffat had entertained the idea of a tunnel here as early as 1902, but it would take twenty more years of political and financial wrangling to make it a reality. 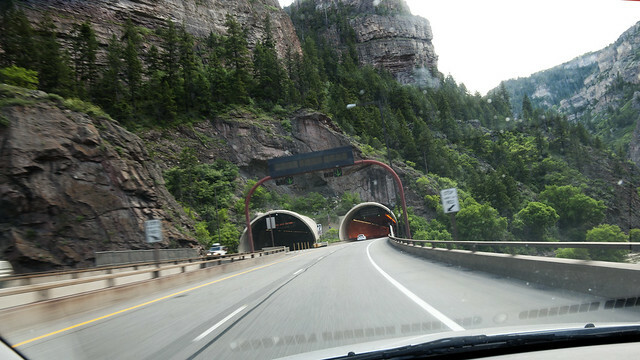 The resulting masterpiece of civil engineering that would bear Moffat’s name was a 6.2 mile (10.0 km) long tunnel – straight through the Continental Divide. 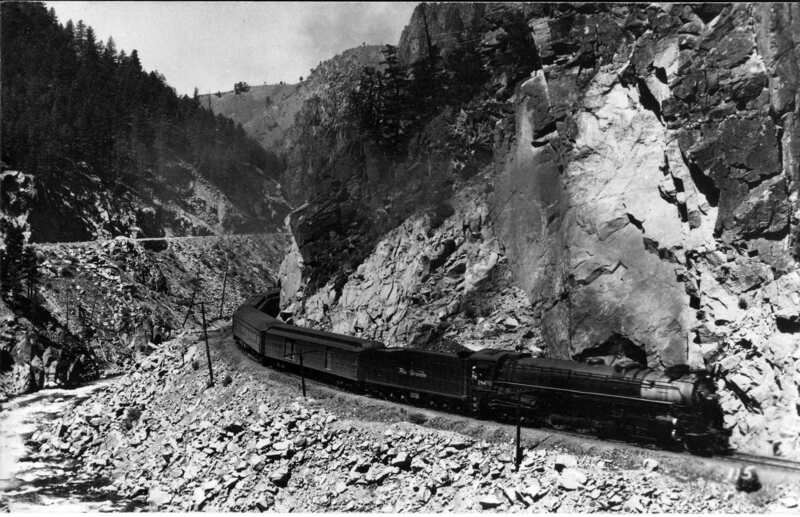 The Zephyr approaches the Moffat Tunnel. 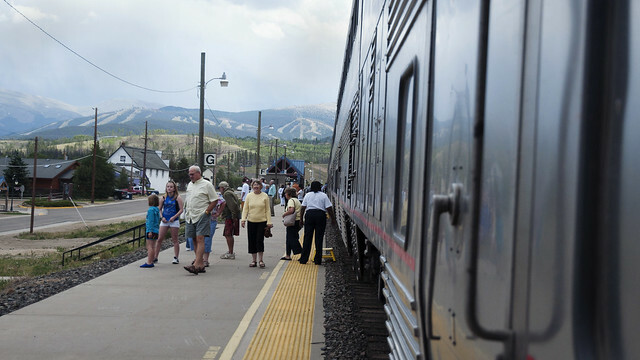 It takes the train about six minutes to pass through James Peak. 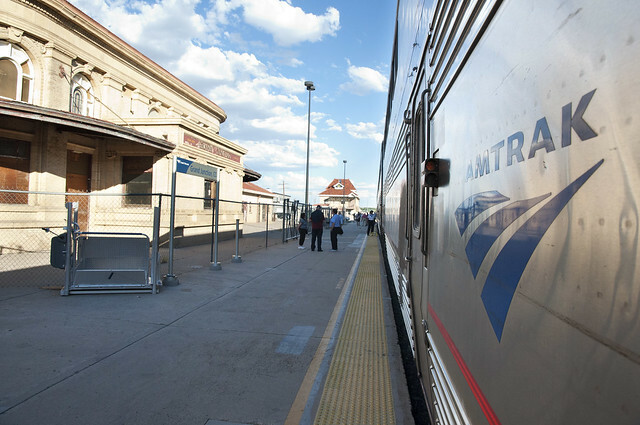 Train #5 calls at Winter Park station, former terminal of the Rio Grande’s Ski Train – the last of the Grande’s passenger trains. The idea was simple: a train leaves Denver full of skiers in the morning, takes them straight to the slopes, and returns them to the city the same evening. The route survived under various owners until 2009. The Colorado River begins in this high mountain valley, and the route of the Zephyr follows it from here to the edge of the Utah desert. 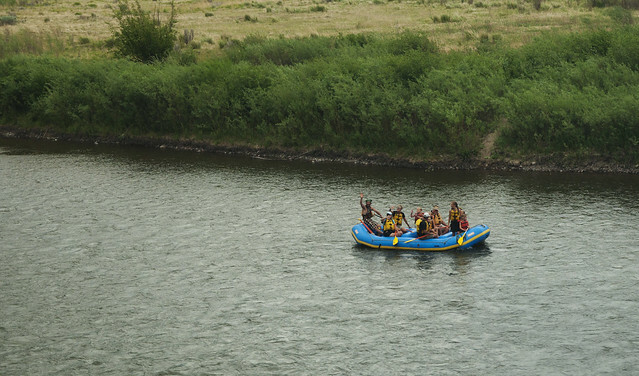 This stretch of the Colorado River is popular among whitewater rafters and kayakers like these. It is a tradition in these parts for rafters to salute passing trains with their rear ends – this group chose to refrain! 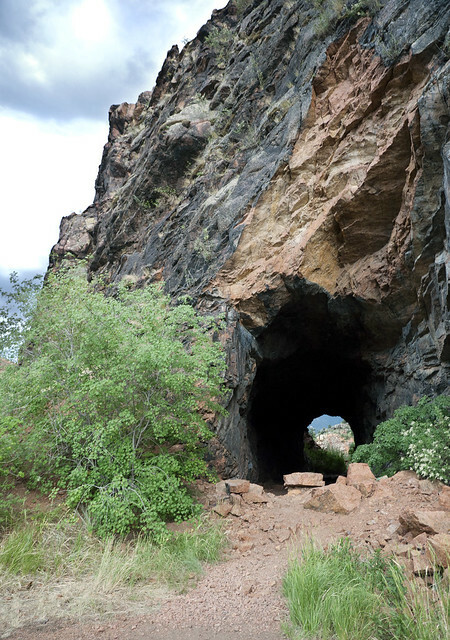 Ahead lay one of the most isolated parts of Colorado: Gore Canyon, a roadless chasm that nearly ran the railroad out of business trying to build through it. 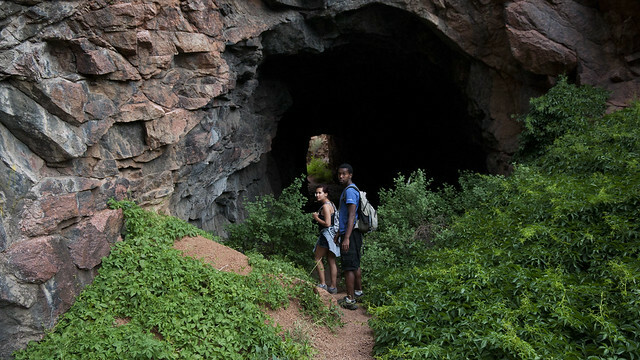 This canyon is inaccessable by any other means; only the Zephyr, a few hiking trails, and the Colorado River below allow people passage. This stretch of track was (and still is) an engineering marvel, with sheer drops, tunnels, and miles upon miles of rockfall sensors and fences. 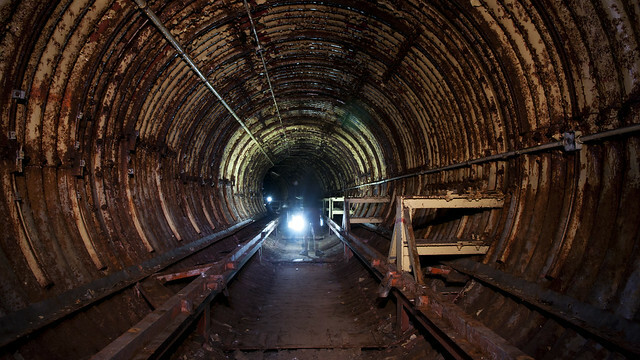 Rockslides in particular are a hazard here; in 1942, a huge steam locomotive hit a large slide while entering a tunnel here and derailed – straight into the wall of the tunnel, causing it to collapse and bury the engine until crews could dig it free. 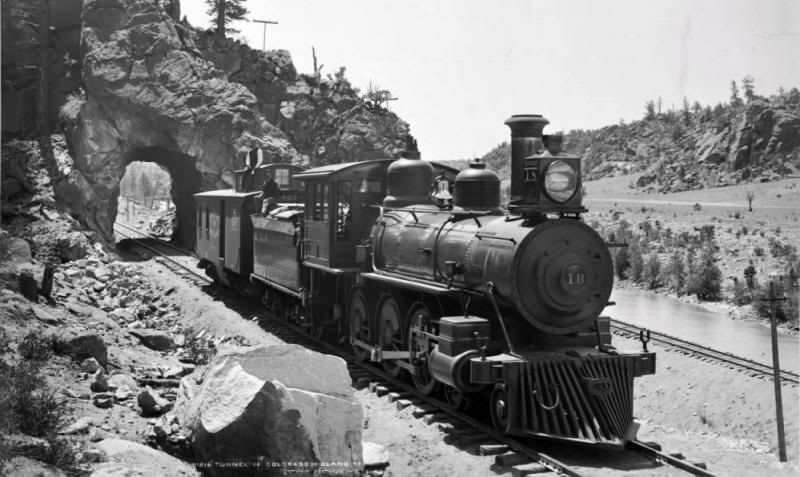 Our locomotives, however, remained firmly attached to the rails as we continued our climb through the heart of the Rocky Mountains. 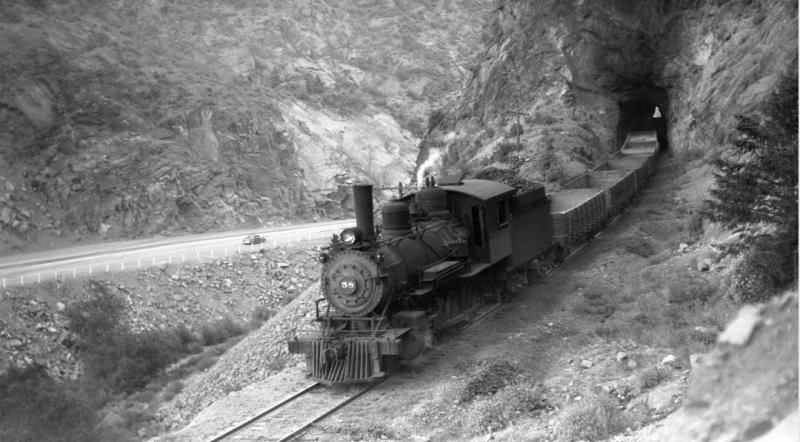 D&RGW steam locomotive #1800 pulls an express passenger train through Gore Canyon in the late 1940s. 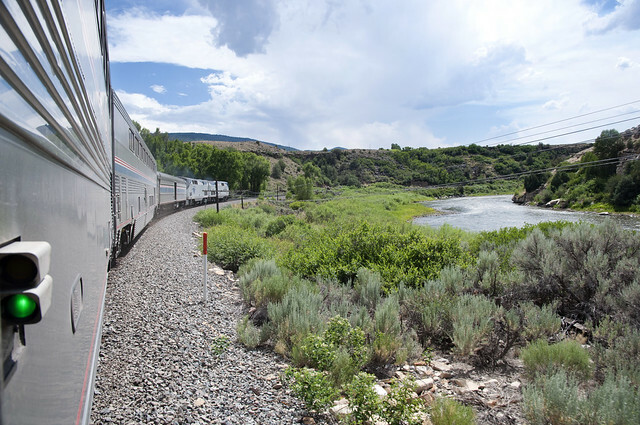 From here, our train follows the Colorado River along a rail line known as the Dotsero Cutoff. 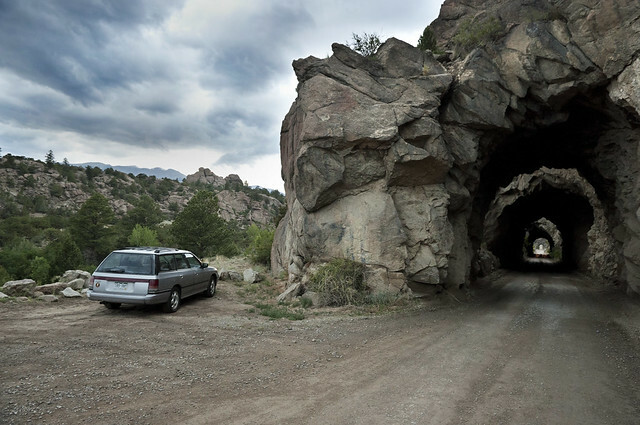 This shortcut allowed more than 200 miles to be shaved off the trip from Denver to Salt Lake City by connecting the Rio Grande’s main line through the desert of eastern Utah to David Moffat’s direct, tunnel-equipped line from Denver. 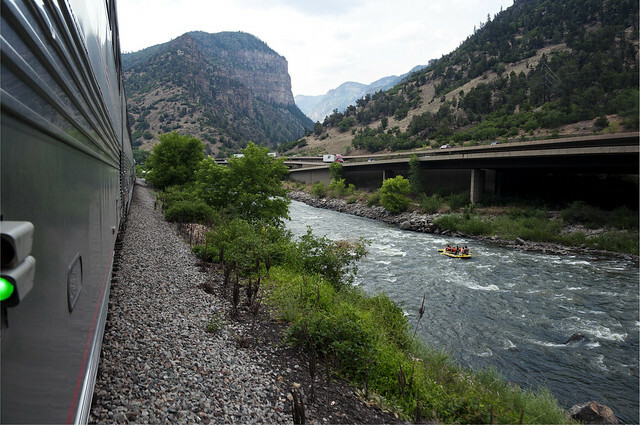 This combination of routes proved its worth through longevity – it still carries thousands of tons of freight and passengers through the Rockies every month. The terrain changes here, too, as the jagged peaks of the central Rockies change to the weathered reddish sandstone and limestone of eastern Colorado. The Zephyr takes a long curve along the Colorado River. 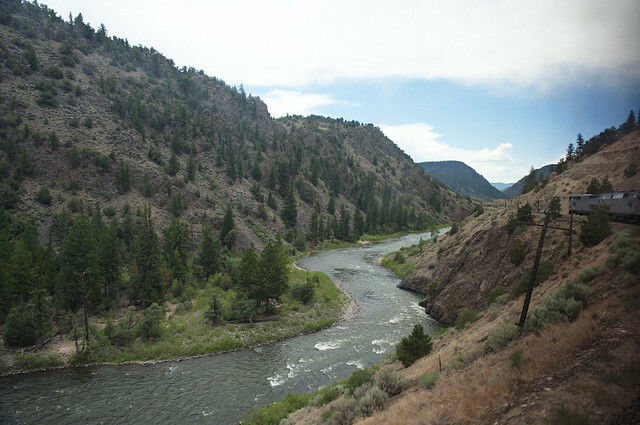 There are few places I’ve been to so far that even come close to the natural beauty of Glenwood Canyon. This rugged chasm in the Earth was carved out of the surrounding rocks by the Colorado River over eons, leaving some of the most spectacular land forms I’ve ever encountered. 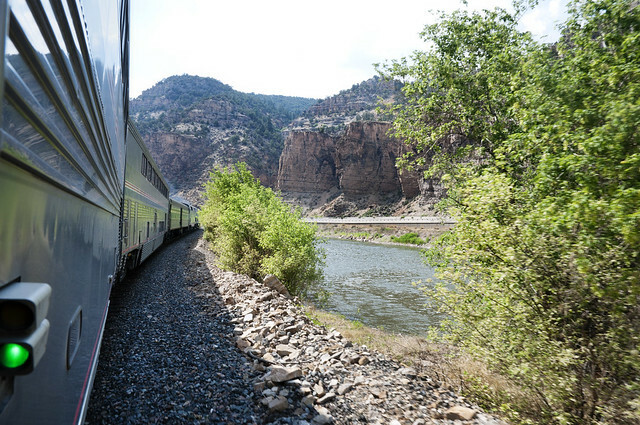 Since its first run in the late 40s, the California Zephyr has been specifically timed to pass through the canyon during the day regardless of direction, always giving its passengers an eyeful of western Colorado. Our train was no exception to this rule, and as we approached the canyon’s mouth, I gave up my seat on the upper deck of the car and found myself a spot next to a window in the lower vestibule – a window that conveniently opened, allowing me to indulge my habit of sticking my head (and camera) out of moving vehicles. 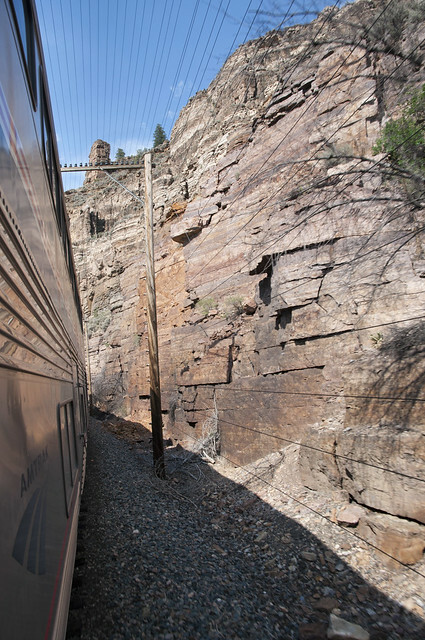 The sedimentary rocks that make up Glenwood Canyon also make this route particularly susceptible to rockslides. 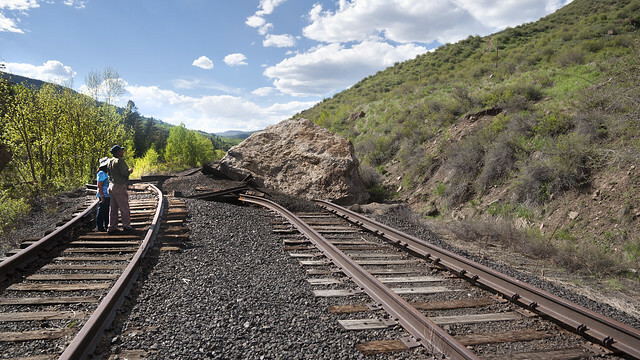 To prevent the inevitable accidents and derailments, the railroad devised a system of rockslide fences meant to warn oncoming trains. 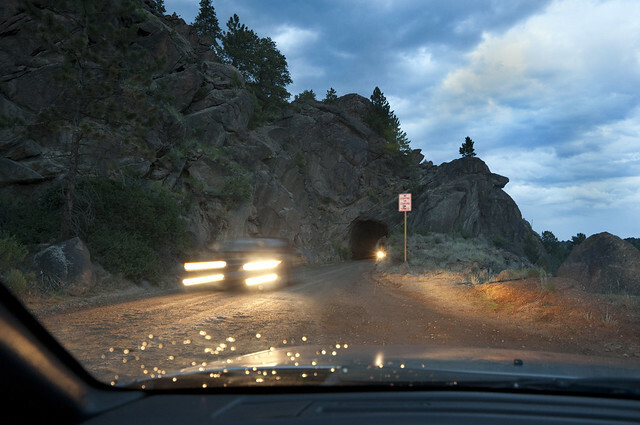 An electric current is passed through the wires guarding the track, and when a rock slide breaks the wires, the broken circuit trips a signal warning of the danger. 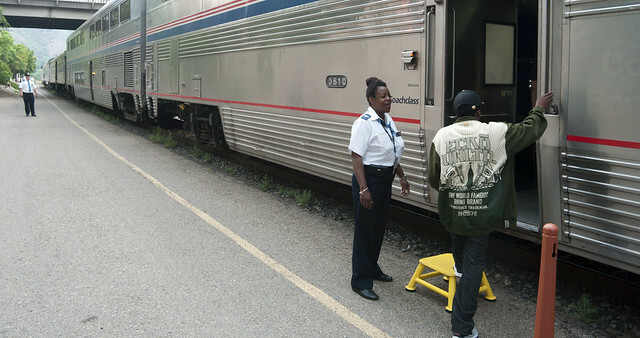 Julia Thompson-Johnson and the rest of the conductors sound the ‘All Aboard!’ at the Zephyr’s stop in Glenwood Springs, a city of nearly 10,000 people nestled in the heart of the canyon.